Purchased by Patti Langton for £1.50 on 21st March 1979, at the home of the potter at Lomachada village for £1.50, as part of the British Institute in Eastern Africa's Expedition to the Southern Sudan [RTS 10/6/2004]. Ornament for a bull, consisting of a pendant, made from an oval piece of ivory, with a long straight edge at the top, convex upper and lower surfaces and slightly curved ends and lower edge. This is slightly lentoid in section. It has been pierced twice in a horizontal row near the top edge, with the holes bored at a slight angle. The front surface has been decorated with a series of shallow, circular depressions; these have been filled with a dark brown to black material to make the design stand out against the light cream colour of the ivory (Pantone 7403C). These have been arranged in two rows with irregular spacing, making a large 'M' shape' across the surface. Two suspension loops have been fitted through the pendant's holes, each made from narrow strips of dark brown animal hide, with traces of hair still visible on one surface (Pantone 7533C). These look to be made with a stiff vertical hide strip core, around which additional strips have been plaited. The object is complete and intact, and all surfaces have been highly polished. Several cracks are visible on both faces, largely following the grain of the material. The pendant has a length of 165 mm, is 43.8 mm wide and 16.6 mm thick; the holes have diameters of 9 mm; the hide strips are each around 5 mm wide, with the suspension loops being 15 mm wide and 5.5 mm thick. Purchased by Patti Langton for £1.50 on 21st March 1979, at the home of the potter of Lomachada Village, in the Kisawo clan area, as part of the British Institute in Eastern Africa's Expedition to the Southern Sudan. 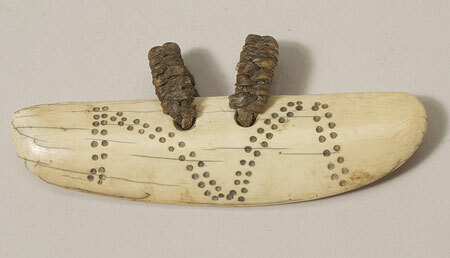 This ornament is known as nyangoletom, and is attached to the horns of a man's favourite bull. At his initiation, each boy chooses a bull, and maintains a special relationship with it until its death, composing songs, and hunting and raiding for it. A bone pendant of similar form is in the Smithsonian Museum (No. 83-3-13), attributed to the Toposa, who are said to loop the suspension thong on the object around the horns of their cattle, with the pendant resting on the animal's forehead [http://www.nmafa.si.edu/pubaccess/pages/rsdadvn.asp?ObjectID=2717]. John Mack has commented that amongst the Toposa, the markings on these pendants may duplicate the marks tattooed on the shoulder of the bull's owner ( pers. comm., 8th October 2004). See also A. Kronenberg, "The Longarim favourite Beast", Kush IX, pp 258-277. Accession Book Entry - [p. 185] 1979.20 (.1 - 206) P[urchase] MISS PATTI LANGTON, DEPT. of ETHNOLOGY & PREHISTORY, OXFORD. Collection made by Patti Langton during the British Institute in East Africa's expedition to the Southern Sudan; Jan. - April 1979. The collection was made in three culture areas during the dry season. The amount paid for each object is listed if the information is known. In Jan. 1979 £1 is equivalent to 95 piastres (pt.) Sudanese. This documentation is based largely upon Patti's own list of objects and her notes on these. Sometimes objects included in the Pitt Rivers alootment of the collection do not appear on her list and have been added here. See Related Documents file as well. [p. 204] 1979.20.136 - 193 SOUTHERN SUDAN the LARIM The Larim live about 50 miles west of Kapoeta in the eastern corner of S. Sudan. They are a non-Nilotic pastoral people, living in permanent mountain villages. They are part of the Didinga-Longarim-Murle language group. They live in the Boya Hills - Boya is the Topasa (neighbouring group) name for the Larim, which is also used by the Administration. Longarim is the Didinga's name for them but they call themselves the Larim, and that is used here. [p. 205] The LARIM The collection was made in two parts. The "PL" labelled material was collected during Pat Langton's stay in a village in the Northern Larim area. The "∆" labelled material was collected by Jill Goudie, one of the archaeologists on the Expedition, from the base camp LARYOK, among the Southern Larim. Money is known among the Larim but it is used only for buying beads for women from Kapoeta, or for the few members of the group who would go to Juba. The women especially were more interested in exchange gifts of salt, cloth & soap. The Larim material is documented in three parts: a) General Larim pieces - no information as to which section of the Larim it comes from b) the "PL" Collection from the Northern Larim, from three of the eight Northern Larim clans c) the Southern Larim material collected by Jill Goudie, numbered "∆". [p. 206] 1979.20.140 - 148 NORTH LARIM/BOYA KISAWO CLAN AREA LOMACHADA VILLAGE 21-3-79 [p. 207] 1979.20.147 Ivory ornament, nyangoletom , which is attached to the horns of a man's favorite bull. Each boy at initiation chooses a bull with which he has a special relationship until its death. He would compose songs and hunt and raid for it. L = 16.5 cm. Coll. no. PL 15; cost £1.50. Ref. : Kronenberg, "The Longarim Favorite Beast." and Kush 1961 [A. Kronenberg, "The Longarim favorite Beast", Kush IX, pp 258-277]. Additional Accession Book Entry [below accession number in red biro] - A5-F35-21. Card Catalogue Entry - There is no further information on the catalogue card [RTS 24/5/2004]. Related Documents File - 1979.20 contains a typed packing list, which has been annotated; a typed list of objects arranged by Langton collection numbers and with pencil and biro annotations, and a handwritten list of objects by museum number, essentially repeating this information and annotated with PRM photo numbers in red. This handwritten list seems to be the direct source for the accession book entry. This item appears in Langton's list under the heading 'purchased at the home of the potter, Kisawo clan area Lomachada village' [RTS 12/1/2004]. Pitt Rivers Museum label - S.SUDAN NORTHERN LARIM. Ivory bull ornament. P. Langton coll., PL 15. 1979.20.147 [plastic label with metal eyelet, stored in RDF; RTS 19/5/2005]. Written on object - PL 15 (pencil) [RTS 25/6/2004]. Sparks, Rachael. "Northern Larim pendant" Southern Sudan Project (in development). 03 Jan. 2006. Pitt Rivers Museum. <http://southernsudan.prm.ox.ac.uk/details/1979.20.147/>.